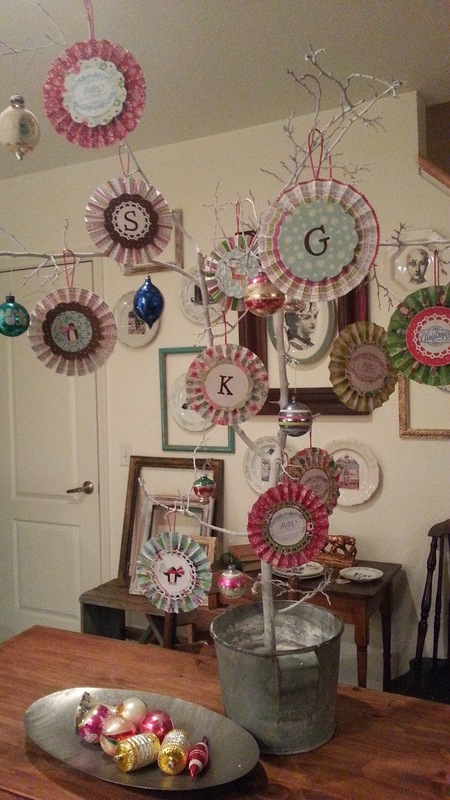 Over the holidays, I'd created a "Christmas tree" as a display piece for a couple classes I was giving on how to make paper rosettes. After the classes, I used it as a Christmas decoration at home to display some vintage glass ornaments and some paper rosettes. I loved how it looked and as I packed away the decorations after Christmas, I could not bear to throw the tree away. The branches were graceful and beautiful. I wanted to do something to recycle my project and to give new life to my little tree. 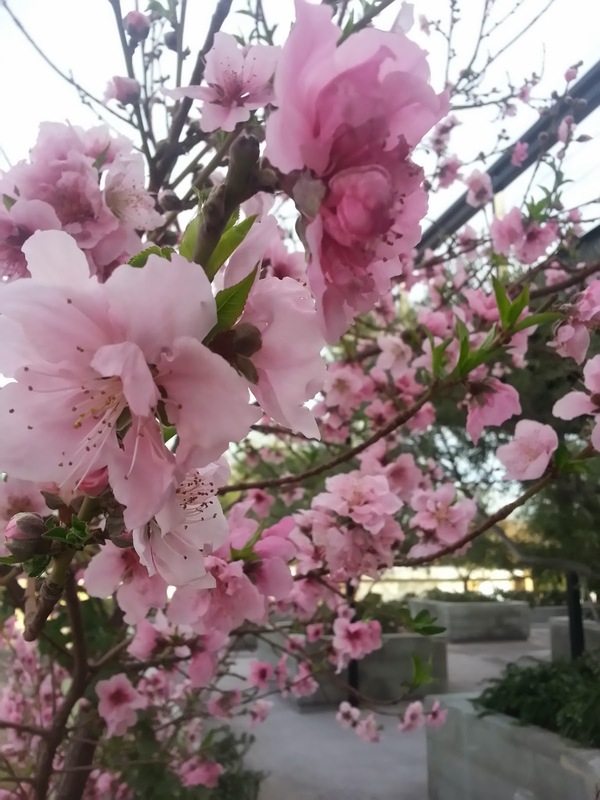 I found my inspiration when I saw a cherry tree in full bloom. 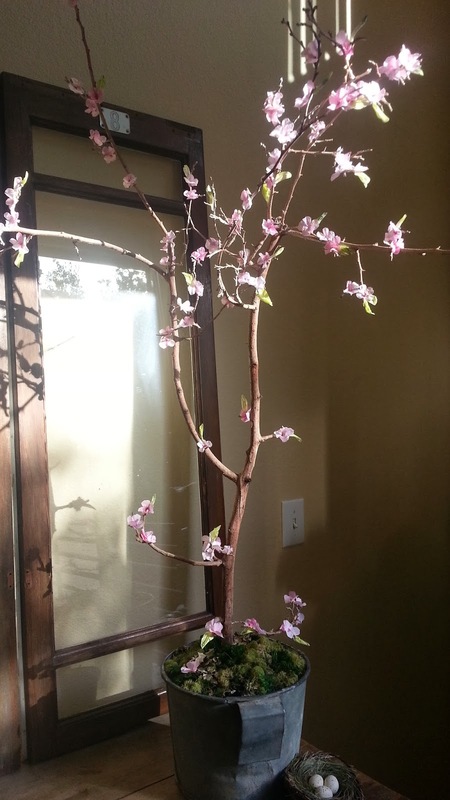 The blossoms were light and ethereal and I knew I could recreate a cool cherry blossom tree at home to bring a bit of spring indoors. 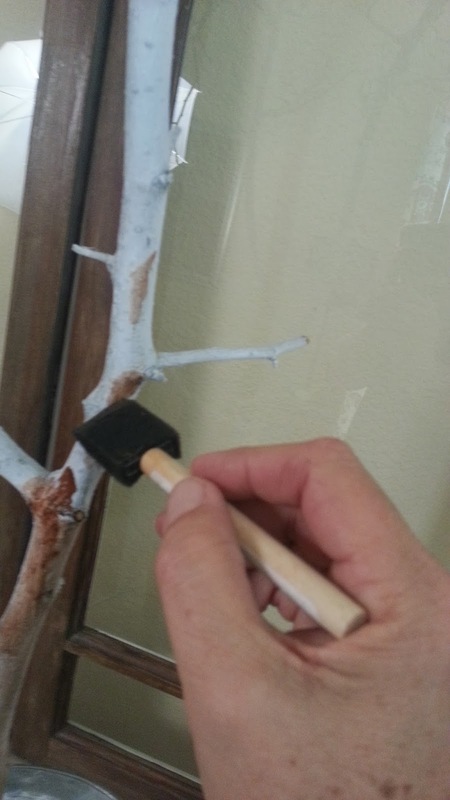 First, I brushed the trunk and branches of the tree with maple gel stain. The gel stain is somewhat translucent and can be brushed on and wiped off to create natural looking wood texture and color. 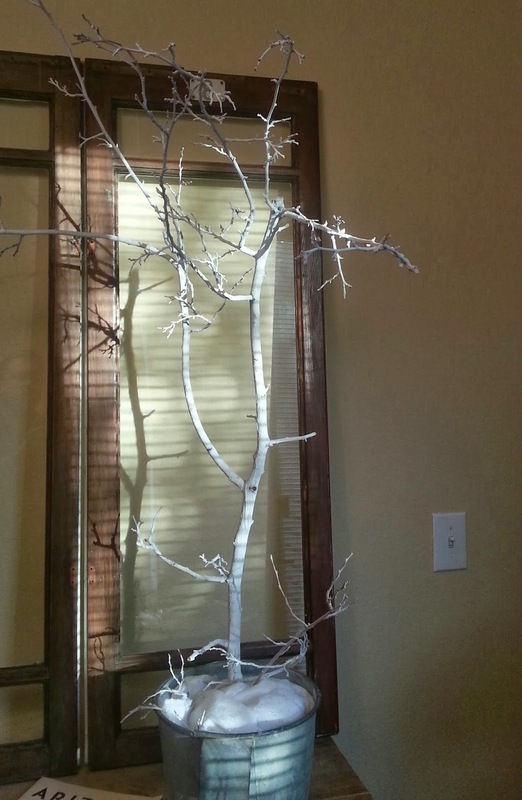 It made the tree I'd spray painted white for Christmas look more natural. 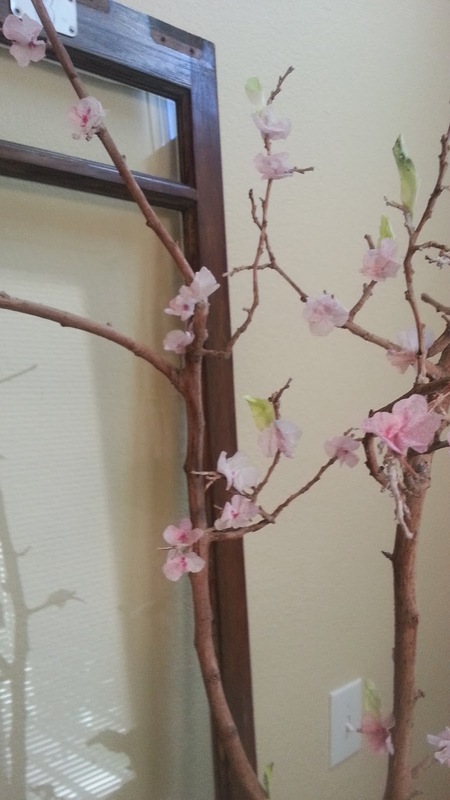 Then, I needed to create cherry blossoms. I used white crepe paper party streamers from the dollar store. For this project, card stock was too heavy to use for the blossoms, they needed to feel light and airy...and tissue paper was too thin. Crepe paper is textured and I thought it would hold up well for coloring and cutting and would hold it's shape when "molded" into blossoms. 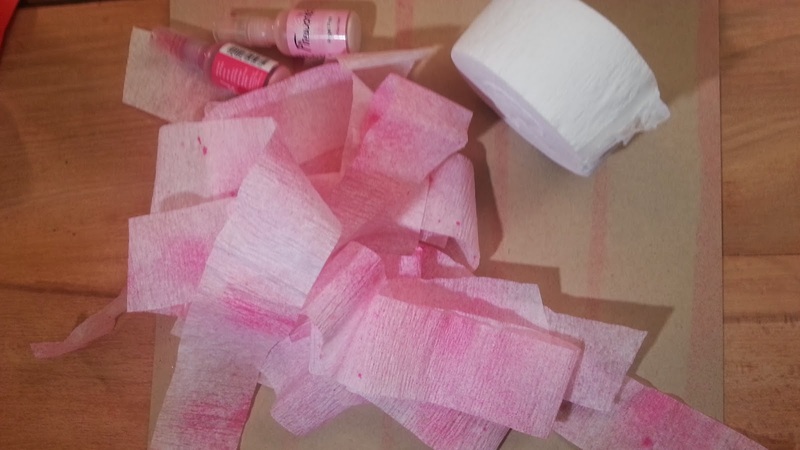 I used craft spray mists to color strips of crepe paper. Misting gave me gradient color variations and tiny spots on the crepe paper. 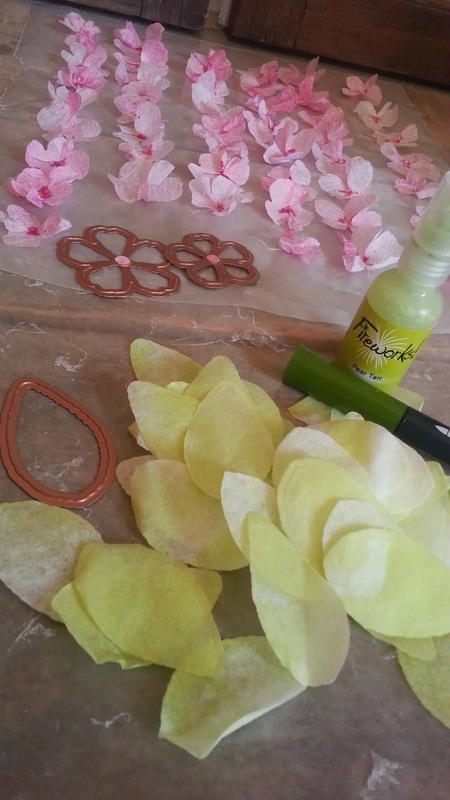 I cut the colored crepe paper with a flower die template, then molded the cut shapes into flowers. 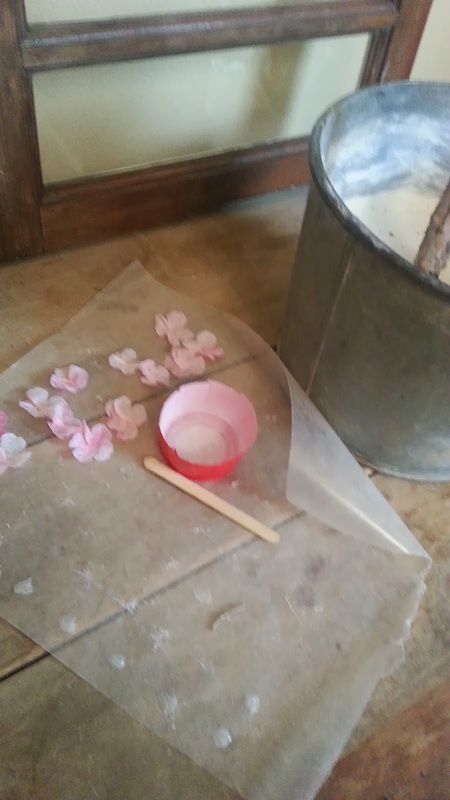 Here's a tip, when you're going to make a lot of flowers, work on waxed paper. 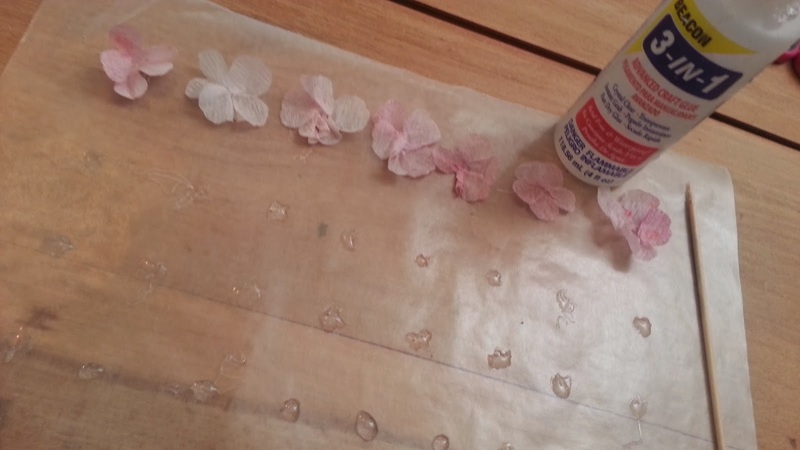 Put drops of glue in rows on waxed paper, make your flowers, then stick them to the dots of glue on the waxed paper. 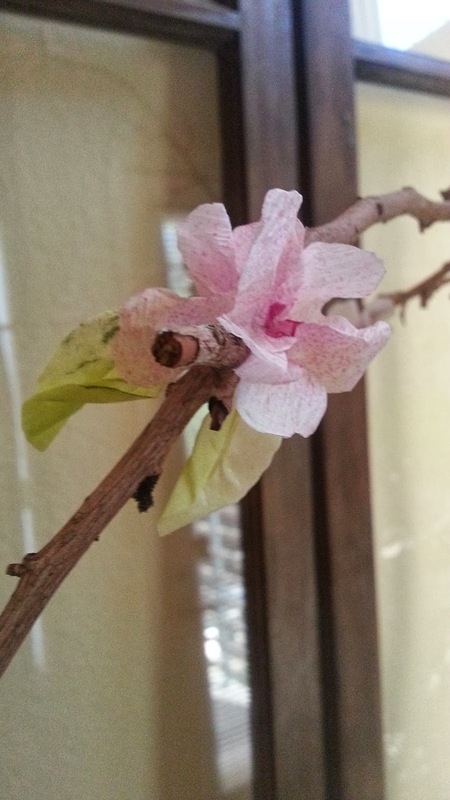 When you're ready to use the flowers, they'll peel off the waxed paper easily. 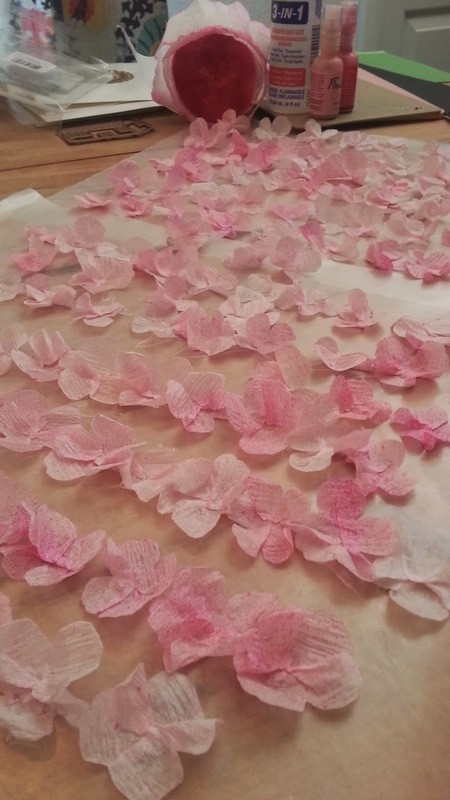 I made a couple hundred cherry blossoms. Next, I created leaves. I used a leaf die template to cut tiny leaves. As they unfurl in the spring, leaves are very light and delicate. Card stock seemed too heavy to use to create the leaves...so I used coffee filters. Coffee filters are light and translucent like fresh new leaves. I misted coffee filters with craft sprays, then die cut a bunch of tiny leaf shapes. To affix the leaves to the branches, I rolled them on one end, crumpled them and used a tiny drop of glue to attach them along the branches. They look cool. 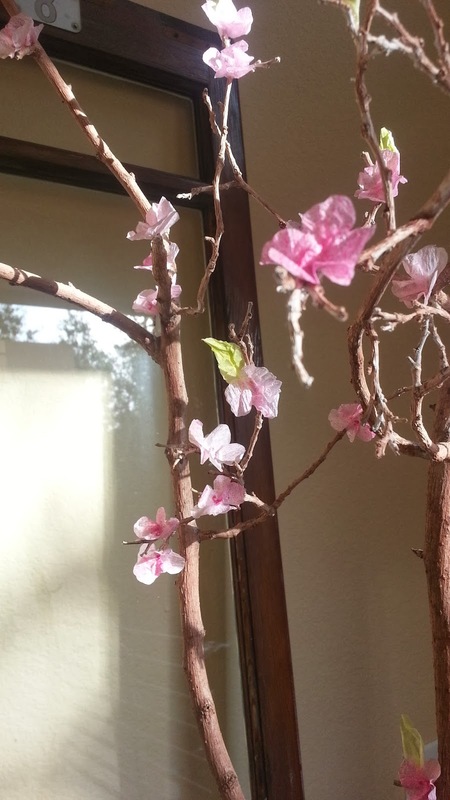 To attach the flowers to the branches, I poured glue into a plastic cup, and used a popsicle stick to apply a tiny drop of glue to each blossom, then placed it on the tree. 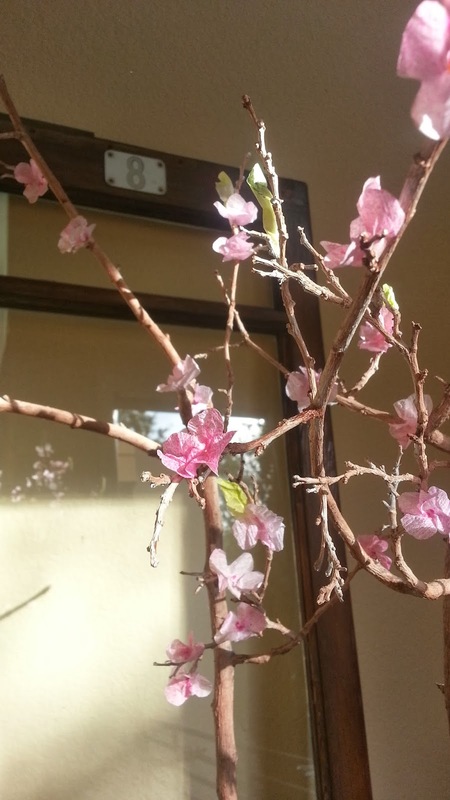 I arranged the blossoms in small clusters, just like they look on a real cherry tree. And repeated the process until the tree looked like it was in full bloom. You'll notice, some of the flowers have a dark center. To make the flowers look realistic, I "dotted" some of them in the center with a magenta colored marker. I didn't really pay attention to the detail of dotting the flowers, I simply went back and randomly added a tiny splash of color to the blossoms. 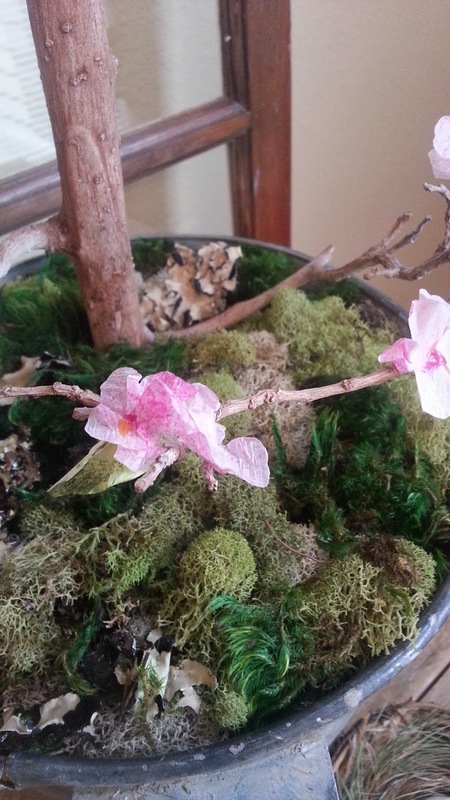 After all the blossoms were attached to the tree, I filled the bucket it's in with sphagnum moss and lichens. You can find these at the craft store in the floral department. It looks really natural and fresh, like spring. 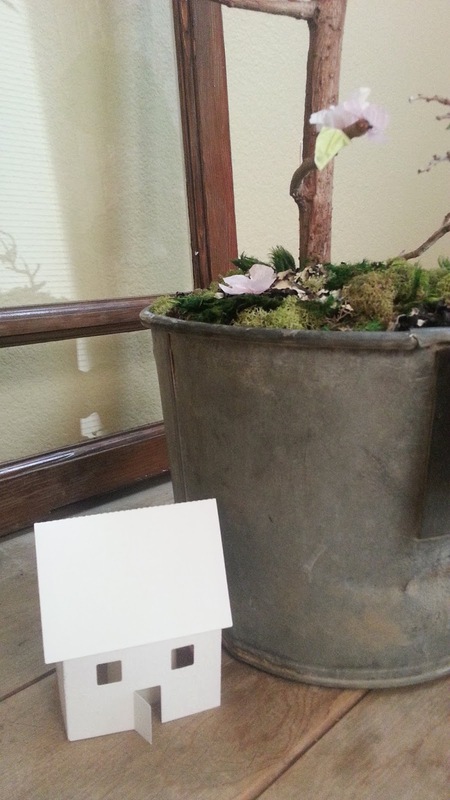 I also added a small birds nest beside the bucket...it feels like spring. 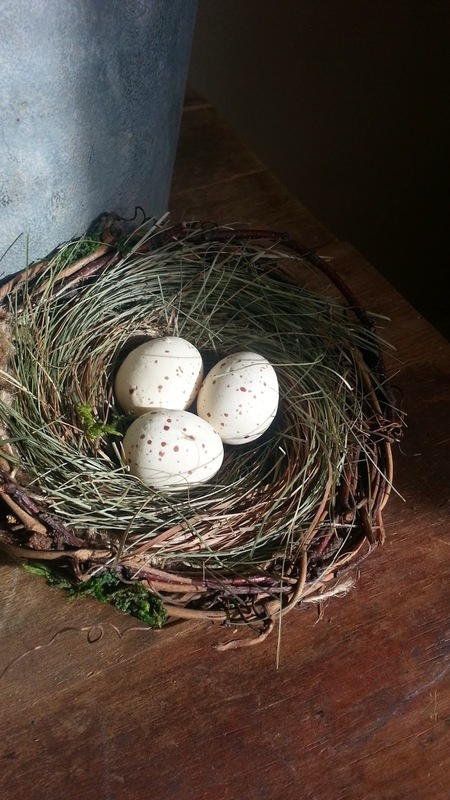 You can find the birds nest with eggs at the craft store floral department too. I love how this project turned out. It feels light, and fresh, like a breath of spring. and help to brighten up my work room in these last days of winter as we're all awaiting spring. Thank you for stopping by today...and I hope you'll like this project and be inspired to create something to brighten up your home for spring. Feel free to leave a comment or ask a question...I like your feedback. I love this project! 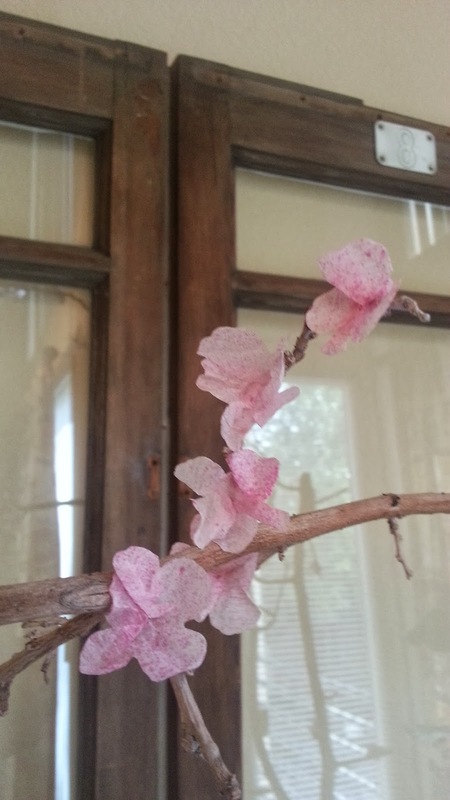 What a neat idea to make these blossoms. Very nice to have some spring started indoors when it is still winter outside. I enjoy the tutorial & tips very much. Thank you for sharing. and it was going to hard to beat the "Bell Jars" which I adore !!!! this is one gorgeous creation ... you have inspired me ... now if it would just stop snowing .... lol! What a wonderful idea! 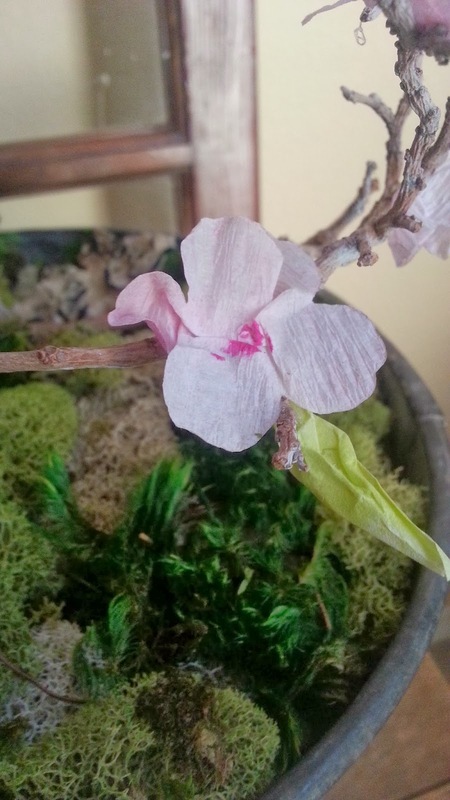 I could use a little "spring" in my craft room, too! Your tree really did turn out great! I think spring has sprung in our state and now you will have a little too inspire you as you craft indoors. Brilliant! Easier to move a little spring inn the house, than all of your supplies outdoors! Consider me absolutely gobsmacked!! This is out of this world amazing!!! Love the light and airy feel that all the different textures add! Thank you for bringing a bit of spring to a winter's day!! Love your work!! So pretty and after this rough winter it would be nice to have a touch of spring! !